Printing PCBs using the toner transfer method works pretty well, but there are some downsides, such as incomplete trace transfers and the like. HackHut user [rucalgary] decided to go the inkjet route instead, and picked up an Epson printer on clearance at his local electronics shop. This method is not new by any means, but his printer conversion is one of the simplest we’ve seen as it does not rely on any additional sensors to function. 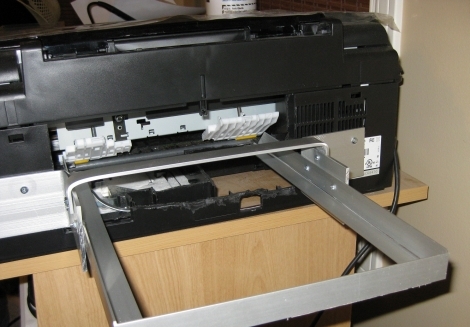 Once he got home, he tore the printer down immediately, removing the paper input and output trays as well as the scanner bed. After all of the extraneous parts were removed, he got to work raising up the printer head, as well as the printer head rest mechanism. He mentions that the latter component is absolutely crucial to proper functionality down the line. Once the print head and its associated components were relocated, he added a pair of aluminum rails for feeding his print tray into the machine. With everything complete, he filled up a spare cartridge with ink (he says that MISPRO yellow works best) and ran some test boards through. He is quite pleased with how things turned out, and is more than happy to give you a quick tour of his completed printer via the video below. Great hack! Very useful for making your own PCBs. I have an Epson printer pretty similar to this one and will attempt the hack some day in the future here. Yeah I don’t get why he did not show blank board going in, then being printed on. I get that this could be slow, but going through the motions and NOT printing live just leaves me scratching my head.. It seems like the coating the printer leaves would be very, very thin. It’s clever, but I’ve spent so much money on inkjet printers, do I really want to waist more time and money with them? I am rucalgary from Hack-Hut. Yes, the printer works, I choose my words poorly. I had just printed it off, and forgot to record it, so I figured I might as well explain how it works. I plan on doing some more boards this weekend, so I will be sure to Record the actual process start to finish. I’ve done something like this, also using an Epson printer with yellow MISPRO ink, but just using the CD printing assembly so I didn’t have to modify the printer at all. My problem was that the ink would sort of pool into tiny droplets, each one about 0.5mm in diameter. Then when I etched, there would often be breaks at some of the droplet boundaries. I guess now that pre-heating the PCB might solve that problem but I wonder if the heat would be sufficient throughout the printing time. Now I’m using PulsarProFx films with a laser printer and cheap laminator. Yeah, it’s more expensive to get set up and really tedious to go through all the steps, but at least it’s consistent and has really good results. 0.2mm traces are no problem. The direct inkjet process is really fast as long as the bugs are worked out. I now think that pre-heating is critical to get a uniform coating of ink. Maybe some kind of constant heat source under the aluminium plate might be more consistent? Back when I was doing this, I would throw the just printed PCB into an oven for about ten minutes, which set the ink. i’ve killed 3 printers trying to do something like this, the first was a cx4900, everything was ok until the printer doesnt recognize any cartridges (i was using cartridges with autoreset), then the c92, every was ok until the motor driver literally exploded on the first test (im looking for a c92 main board to replace that), and finally the c110, i dont know why this printer as the cx4900 does not recognize any cartridges after a while. thanks God they were not too expensive to get. Great idea, I went on to make one after reading the article(w/ broken HP 932c). I just tested a print on a thick MDF clipboard and it works quite well. Need sleep badly now, cant wait to try with copper clad.